From the second half of the 18th century onward there are detailed measurements and architectural drawings of the surviving parts of the 6th century B.C. temple of Apollo at Corinth. Scholars who studied and/or excavated the temple propose different dimensions regarding the stylobate and intercolumniations. This is due to extended material loss and disturbed axes of the standing columns. The height of the temple, as well as the dimensions of various architectural elements of the building, have not been estimated. Moreover there are different views and interpretations regarding parts of the cella. In this paper the results of previous research and scholarship are reexamined, analyzed and discussed in view of new observations and measurements conducted by the author on the field in 2007. The purpose of this work is to elucidate representation issues and explore whether there is surviving evidence or fragmental data that could extend our knowledge on parts of the temple and missing elements of the plan and elevation. 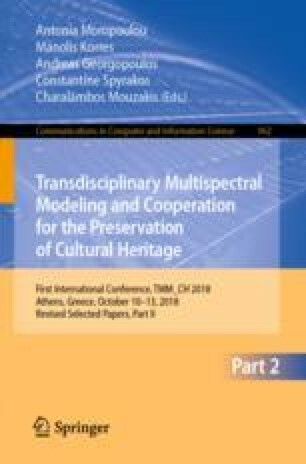 One of the novel contributions of this study is to present a graphical reconstruction of the facade and side of the temple of Apollo at Corinth, as well as a reconstruction - to the extent possible - of the pronaos and longitudinal section. Finally, a statement of significance and a synopsis of the outstanding values of the temple of Apollo is attempted. This paper presents results of a research conducted under the supervision of Prof. Manolis Korres for the MSc thesis of the author (2008, School of Architecture, National Technical University of Athens). Results of this MSc thesis have been also orally presented in 2014 within the framework of the Lectures on the History of Architecture (National Technical University of Athens). I am grateful to Prof. Manolis Korres for his precious guidance. Our discussions on the subject and his observations substantially improved the results of my study on the temple. Any errors and/or misconceptions remain my sole responsibility. I would like to thank the American School of Classical Studies at Athens for granting me permission to study the remains temple and have access to the archives and storage areas of the ASCSA. I also thank the Ephorate of Antiquities at Corinth for granting me permission to study on the site of the temple.